Gain insider tips on how to help avoid pesky job site call backs. Learn why surface preparation is critical to a successful tile installation. Understand the common misconceptions of surface preparation, plus how to avoid pitfalls of improper mortar and grout selection. The 4 secrets to success discussed in this 45-minute webinar may save you hours on call backs and become the cornerstone of your personal business motto. Anyone can register for the webinar. Register now! 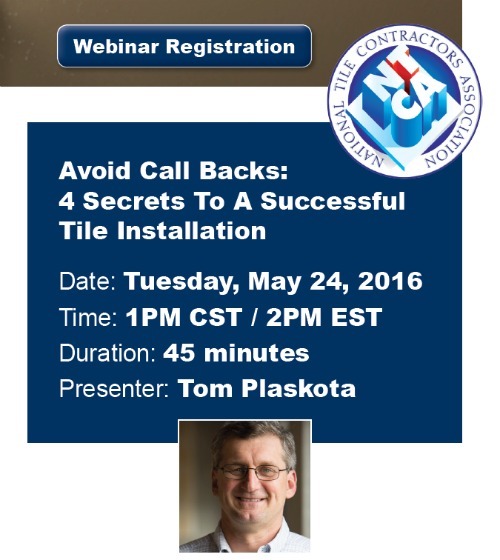 TEC® presented a webinar that reached record NTCA webinar registration on exterior tile installations on July 22, 2015. This webinar, titled “Strategies for Exterior Tile Installations”, explored products and strategies that will guide professional contractors toward successful installations in difficult outdoor environments. The webinar was hosted by NTCA and sponsored by TEC. Tom Plaskota has been working with the TEC® brand of surface preparation and installation systems since 1997. In addition to his involvement with the NTCA, Plaskota is a former industry director for the Chicago CSI Chapter. His role as technical support manager requires him to manage the TEC® field support team in their services.